Friday, September 8, 9:30 a.m. – Cancelled; rescheduled to September 14, 2017. Friday, November 3, 9:30 a.m.
Friday, December 8, 9:30 a.m. Please call the Pinelands Commission Office at (609) 894-7300 for meeting location, time and agenda items. The Commission’s Comprehensive Management Plan (CMP) Policy and Implementation and Personnel and Budget committees meet between the regularly scheduled monthly meetings. 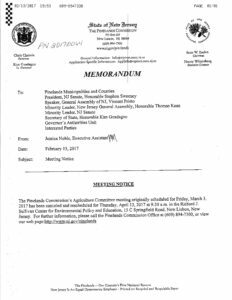 For an updated schedule and locations of committee meetings, please call the Commission’s office at (609) 894-7300.